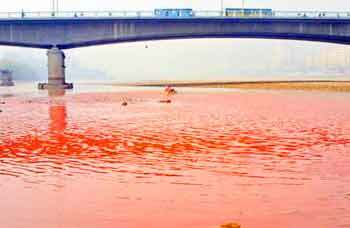 A one-kilometer stretch of <?xml:namespace prefix = st1 ns = "urn:schemas-microsoft-com:office:smarttags" />China's second longest river, the Yellow River, has turned red from pollution for the second time in a month. Waste water was discharged by a station that provides heating for the two million people of Lanzhou, capital of northwest China's Gansu province, at midday on Tuesday. The water contained a red dye which is believed to have been used by the factory to deter wily locals from siphoning off the hot water from the pipes for their own use. After taking samples, environmental officials found that the dye was not toxic. Residents who reported the incident to the local environmental protection bureau said the discharge lasted more than an hour. 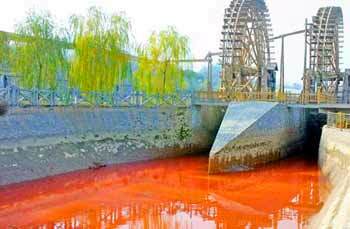 The incident comes exactly a month after the Lanzhou section of the river was turned red by dyed waste water from the Tanjiangzi No.2 Heat Providing station. The Yellow River is lightly polluted, while its tributaries suffer from heavy pollution, according to a report released on Tuesday by the State Environmental Protection Administration. Known as the cradle of early Chinese civilization, the Yellow River empties into the Bohai Sea in Shandong Province in east China, 5,464-km from its source in the Tibet-Qinghai plateau. The river supplies water to more than 155 million people and 15 percent of China's farmland.